High-performance windows substantially reduce the costs associated with heating and cooling. Not only do they provide reduced energy bills, they also bring down peak heating and cooling loads by reducing homeowners’ dependence on HVAC equipment. Additionally, they offer improved comfort due to prevention of cold drafts and overheating, reduced condensation, increased light, and reduced fading of drapes and furniture. The key to the effectiveness of high-performance windows lies in the significant improvements in solar control, thermal comfort, and energy-efficiency that they bring by incorporating vastly advanced frames, low-E coated glazing, inert gas fills, warm edge spacers, and high quality sealants. Not all energy-efficient windows are Energy Star-rated but only those that are manufactured by an Energy Star partner. Those windows are independently tested and certified by the National Fenestration Rating Council (NFRC) and have NFRC ratings that meet strict energy efficiency guidelines set by DOE. 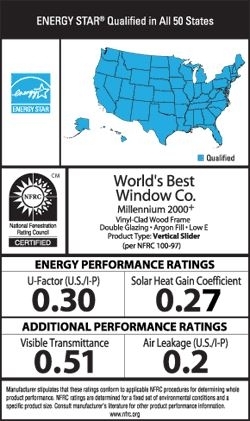 The NFRC window energy rating system is based on whole-product performance. NFRC labels provide important information on the required energy ratings. Terms like U-factor, Solar Heat Gain Coefficient, and Visible Transmittance are often ambiguous to consumers. To make the best choice in energy-efficient windows, your clients need to understand a few of these terms. The following are the basics each homeowner should know when choosing high-performance windows. U-factor measures how well a product prevents heat from escaping a home. The lower the U-factor (0.3 or less), the better a product is at keeping heat inside the home. U-value is the inverse of R-value (a more common term used in the insulation business).It is especially important during the winter season in colder climates. Solar Heat Gain Coefficient (SHGC) measures how much heat from the sun is blocked. The lower the SHGC, the more a product is blocking solar heat gain, which is particularly important during the summer season in hot southern climates. By contrast, people in northern climates would want solar heat gain during the cold winter months to lessen the costs of heating. The lower the SHGC of a window, the lesser the solar heat it transmits. The optimal SHGC for a home depends on several factors, including climate, orientation, and shading conditions. Visible Transmittance (VT) measures how much light comes through a product. The higher the VT, the higher is the potential for daylight entering the home. For double-pane windows, a value of 0.3 to 0.7 is usually recommended. Air Leakage (AL) is a measure of the heat loss and gain of a window through cracks in the window assembly. An AL of less than 0.3 is generally recommended. Condensation Resistance (CR) measures a windows resistance to the formation of condensation. Condensation ruins the visibility of window not to mention the window itself. Higher CRs indicate a higher resistance to condensation. There are, of course, other factors to consider, but this will give you a solid start when choosing energy-efficient windows. Michael Joseph has a natural flair for interior and exterior home décor. He believes home improvements should not only be aesthetic but sensible and energy-efficient as well. Michael is a freelance writer who has had 12 years of experience as an interior designer. He currently writes for Champion Window and other home improvement companies.